Vegetable Upma | The Flavor Nook! 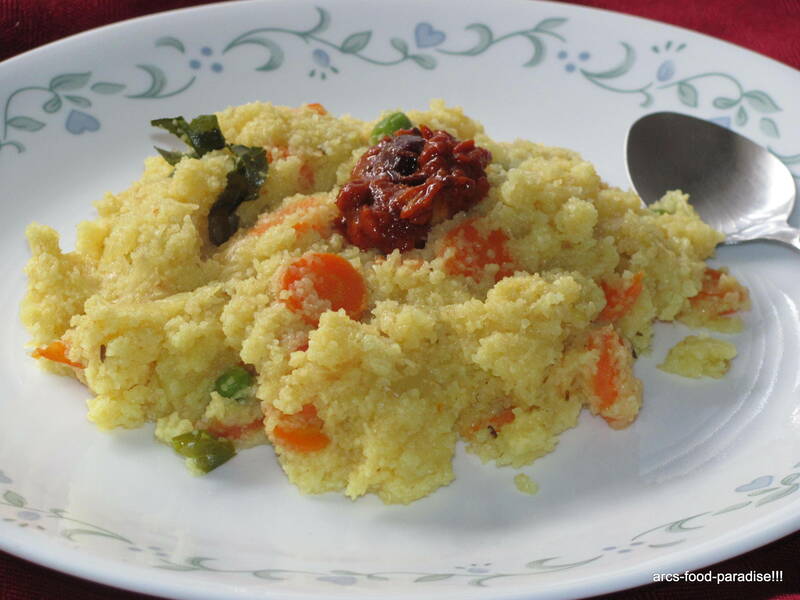 Bored of the plain Upma? Try Vegetable Upma! It is a fancier as well as healthier version of upma. Make it even more healthy? Use cracked wheat instead of sooji/semolina. 1. In a pan, dry roast the cracked wheat for about 4 to 5 mins so that it loses the raw smell. 2. In a wide pot or a karahi/kadai heat about 2 or 3 tsps of oil. Once, the oil is hot enough add mustard seeds, cumin seeds, urad dal and curry leaves. Once they begin to splutter add chopped onions and green chillies. Saute for a few minutes until onions are translucent. 3. Now, add all the chopped vegetables and saute for about 6 to 8 minutes. Add salt and turmeric now and saute for another minute or so. Add water now. Usually water is added as per 1:2 ratio but since I have added vegetables I add an extra cup of water i.e., I have used 5 cups of water here. Cover and bring the water to a boil. 4. Once the water starts to boil, check if the vegetables are done using a fork or spoon. When done, add the roasted cracked wheat slowly to the water while continuously stirring to avoid any lumps. Reduce the stove setting a little. Add coriander leaves. Cover and let it cook for about 5 to 8 minutes checking and mixing in between to avoid burning at the bottom. 5. Serve warm with mango pickle or with some plain yogurt. This can be a healthy breakfast or a quick yet satisfying meal on a busy or lazy day.